Laser hair removal for men and women uses a laser to heat a hair follicle causing damage to it, making future hair growth minimal or non-existent. Patients are required to put on protective goggles during treatment to protect their eyes from laser damage. The patient is made aware of pre-treatment procedures which include shaving the area the day before treatment. A cooling gel is placed on the areas being treated and the laser is then directed on the treatment areas. Using advanced laser technology, a carbon dioxide (CO2) laser for skin resurfacing precisely removes outer layers of damaged skin to reveal the underlying skin which is softer, smoother, and younger looking. CO2 and erbium laser technologies are the two most commonly used laser skin resurfacing treatment options. The CO2 laser is used in the treatment of deeper facial lines and wrinkles, allowing your medical technician to perform skin resurfacing procedures that reduce or eliminate more pronounced lines and wrinkles than similar treatments. This is done by removing deeper layers of damaged skin and stimulating the regeneration of healthy skin underneath. Dr. Iampen from Sensei laser invites you to come in for a consultation and talk to her or one of our nurses for more information on our amazing anti-aging treatments. The Lumenis M22 is the gold standard platform for the treatment of skin conditions and hair removal. Used by physicians around the world, M22 is the multi-application platform that enables you to treat more types of patients and conditions with better outcomes. 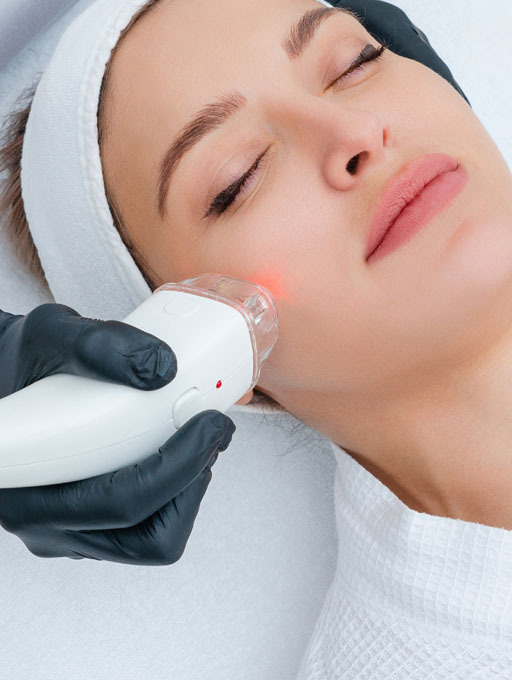 IPL is a treatment that uses non-invasive short bursts of high intensity light to treat melasma, rosacea, broken capillaries (telangiectasia), and improve skin texture and general discoloration or mottling of skin tones. The flexibility in this device is in its ability to use a broad spectrum of wavelengths which can target specific depths in dermal tissue. This is in contrast to “lasers” which only deliver one wavelength at a time. Energy produced by the IPL is absorbed by discolored skin cells which cause damage to those specific cells. The body then eliminates this damaged tissue and synthesizes skin cells as well as collagen and elastin fibers (the cross-linked framework that holds skin together and gives it a youthful appearance). The short burst of energy ensures little to no damage to neighboring healthy cells as the wave length of light used actively selects red and brown pigments in the skin for treatment only. Intense pulse light 20 to 30 minutes prior to the treatment a topical anesthetic is applied to numb the area that is being treated to take the sensation from a sharp elastic band to a dull elastic band and provides comfort to a client during treatment. The topical anesthetic is washed off and a cooling gel is placed on the areas to be treated. The IPL head piece is then used to direct light onto the treatment areas. Treatment areas originally pigmented will be even more pronounced with color. This is expected and shows the wavelength of light has reached the targeted tissue. This is a temporary effect and will dissipate within a few days and brown spots will flake off within two weeks after treatment. Typically, 1 to 3 treatments are used to attain full benefit. It is important to be well moisturized and avoid direct sun exposure as much as possible. A good sunscreen with SPF 30 will help in preventing future discoloration.